A pretty simple 4-step photo tutorial on swapping out the back cover of the ZenPad 8.0 (also same process on the ZenPad 7.0) has shown up on the Asus Taiwan Facebook page. Of all the countries, Taiwan has seen the biggest push so far from a marketing perspective. The most prominent ZenPad released is the ZenPad 8.0, both the wifi (Z380C) and 4G LTE (Z380KL) are currently available, in addition to the budget model ZenPad C 7.0. As is the case with customers in the US who’ve bought the Z580C, the Taiwan market is still waiting for the official Asus accessories to arrive. So as nice as this photo tutorial is, where can people buy the Zen Covers? No answers right now, just questions. 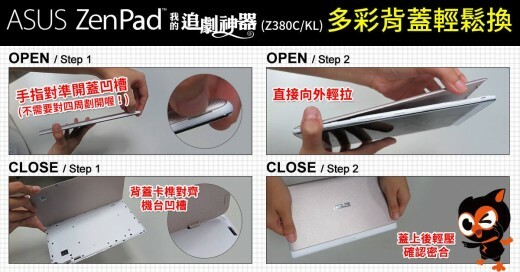 Regarding the customizable/removable back plate on the ZenPad 7.0 and 8.0 tablets, it’s pretty nifty. There is a snapping sound which to us, is quite satisfying as you put in place a new back cover or one of the custom cases like the Audio Cover or Power Case.